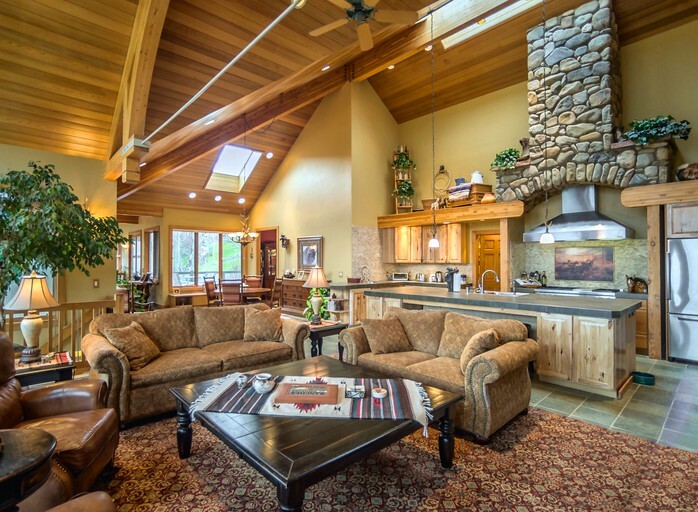 This luxurious, pet-friendly villa rental is found in a gated community near Copper Mountain, in Colorado's rural and beautiful landscape. Up to 15 happy glampers and their furry friends can be comfortably accommodated here, with two stories and plenty of parking space. 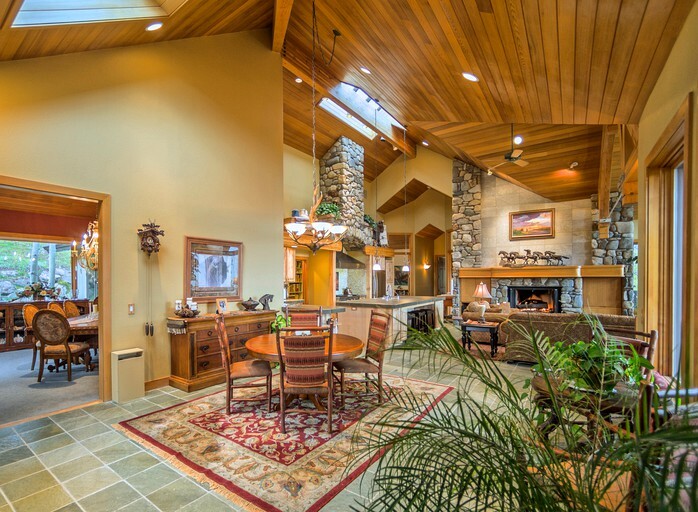 There is an open-plan kitchen here, which forms the ground floor along with the dining area and the great room. 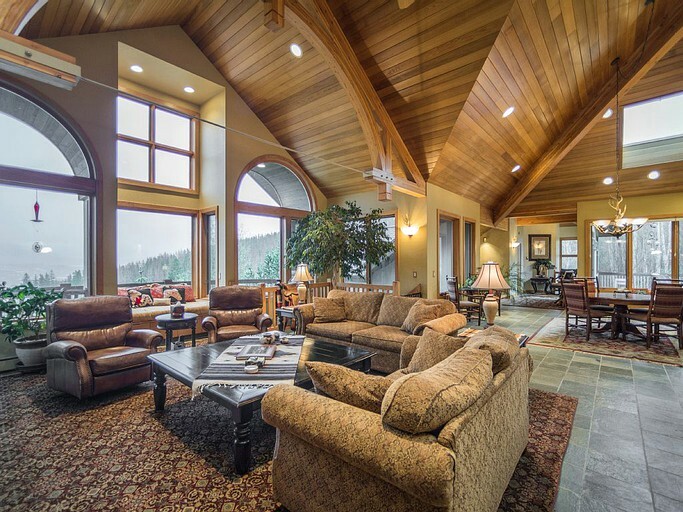 Impressive, cathedral ceilings and enormous arched windows make this an imposing and beautiful spot, with unbeatable views of the Continental Divide and the Keystone ski resort. There is an elevator available for guests to use, ensuring the villa is wheelchair accessible. 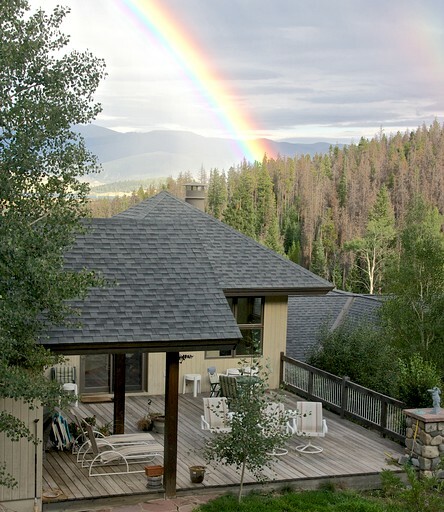 The property offers three front facing decks, and one private west-facing deck on the main level, furnished with an outdoor seating and dining area to relax and take in the stunning surrounding scenery. The outdoor space also comes with an outdoor grill to enjoy a BBQ in the summer. 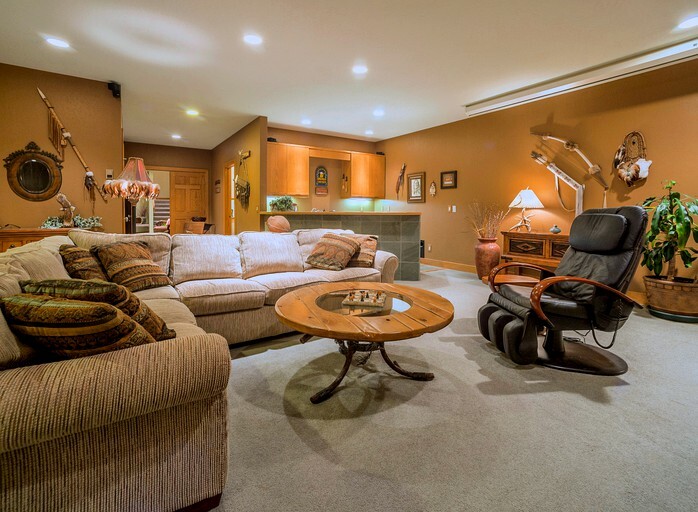 The spacious family entertainment room features a wet bar, large screen theater and fitted with surround system making the perfect entertaining space. 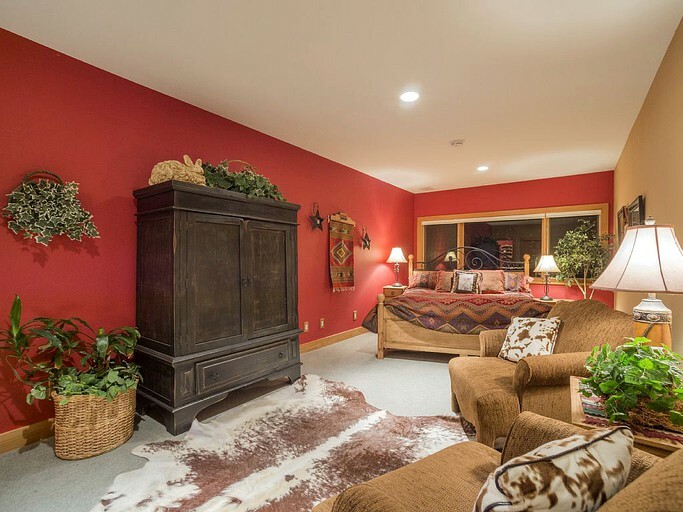 The two sofas can also be turned into beds to accommodate additional guests. 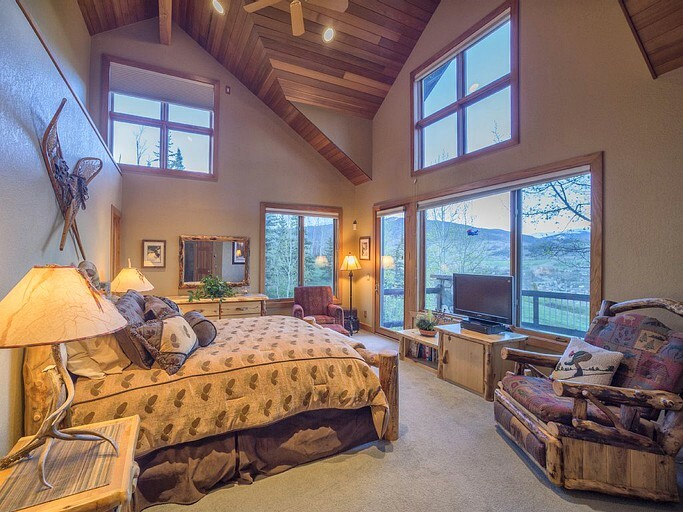 On this floor, guests will also find three bedrooms; one with a king-size bed, a private bathroom and a seating area. 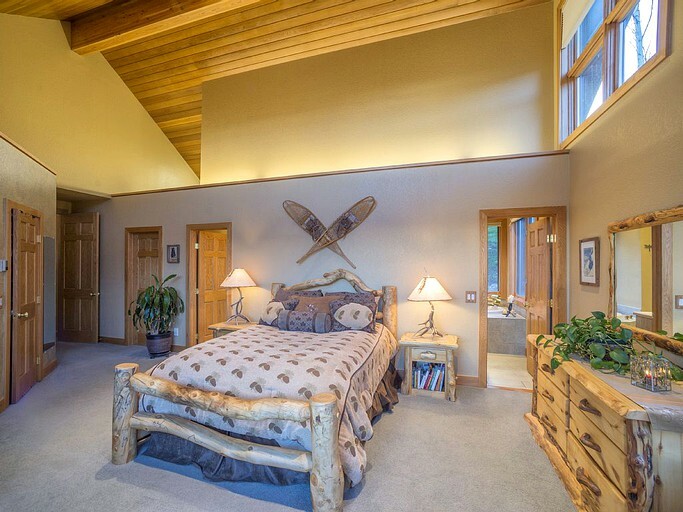 The second is furnished with two sets of bunk beds (making four twin beds), and the third with a queen size bed. 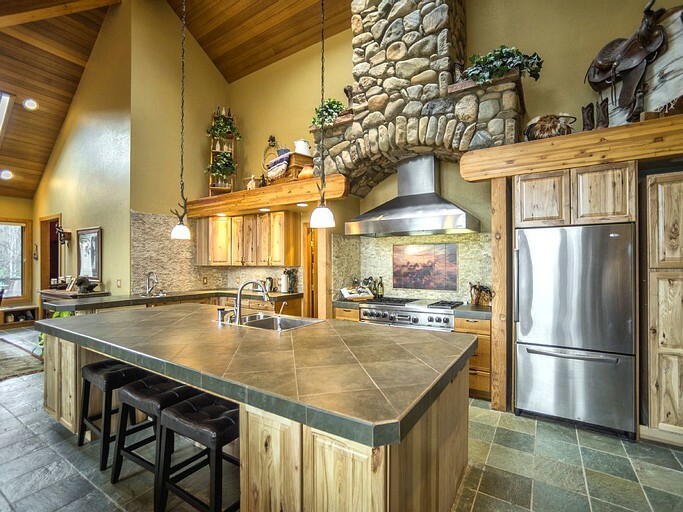 The large gourmet kitchen comes with a six burner stove and griddle, double ovens, a microwave, a dishwasher, and a sub-zero refrigerator to support all of the guests catering needs. There is an island in the center of the kitchen area with bar stool seating, as well as the eight-seated dining table to enjoy a lovely meal with friends or family. 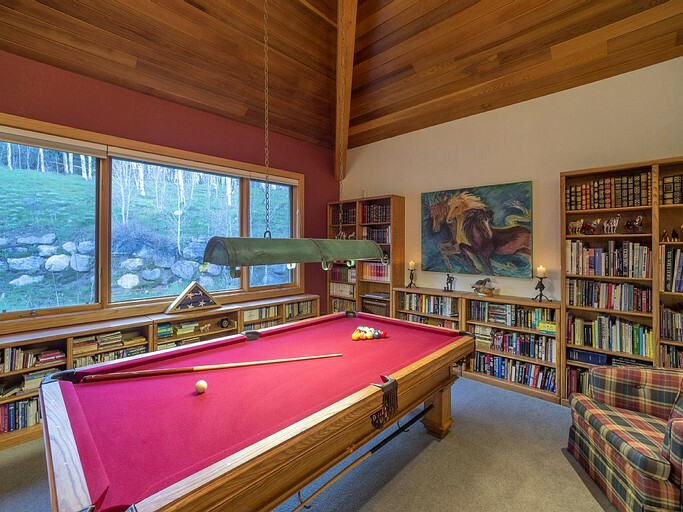 The upper-level of the villa has another well-sized living room with a fireplace, and windows providing fantastic views, a private office and a pool table room. The sofa here can also be converted into an extra bed. 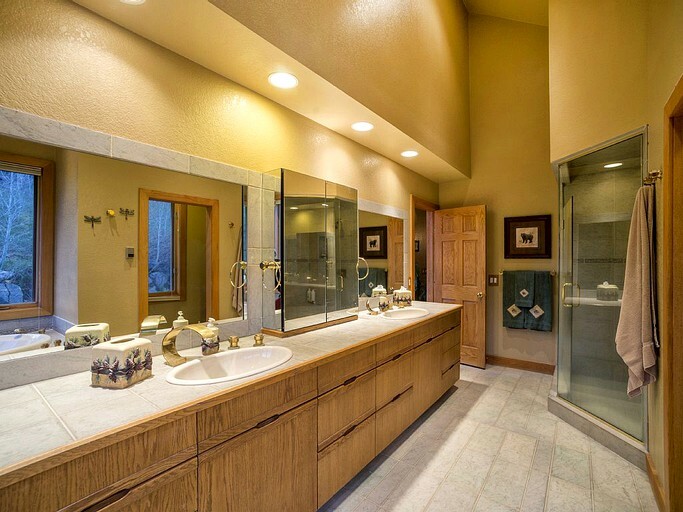 The two master suites are located on this floor, one with a spa-like bathroom, a bathtub with jets, an enormous glass shower, and a double vanity. The other master suite is also fitted with its own bathroom with a toilet, jetted bathtub and shower. 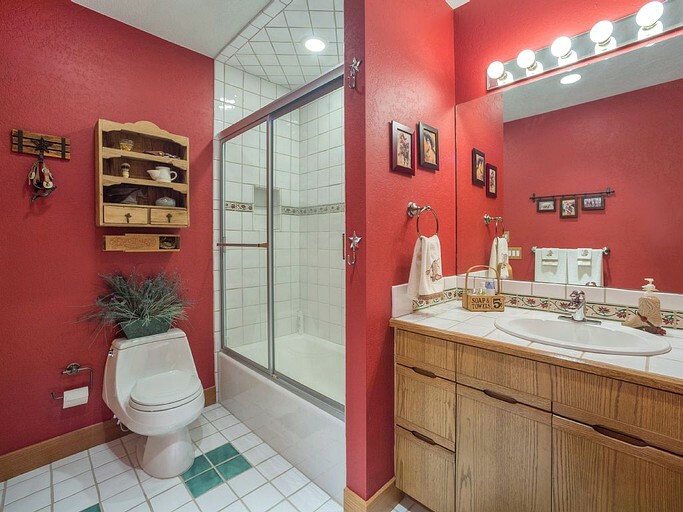 Guests will find four additional bathrooms, three of which come with a shower. This private estate has everything glampers could possibly need to make for an enjoyable and luxurious stay. 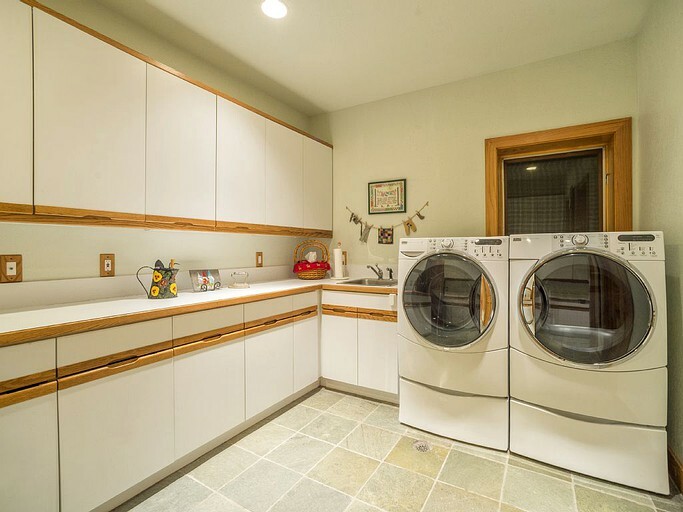 Guests can stay connected with the internet, as well as a television, a DVD player, and a stereo. 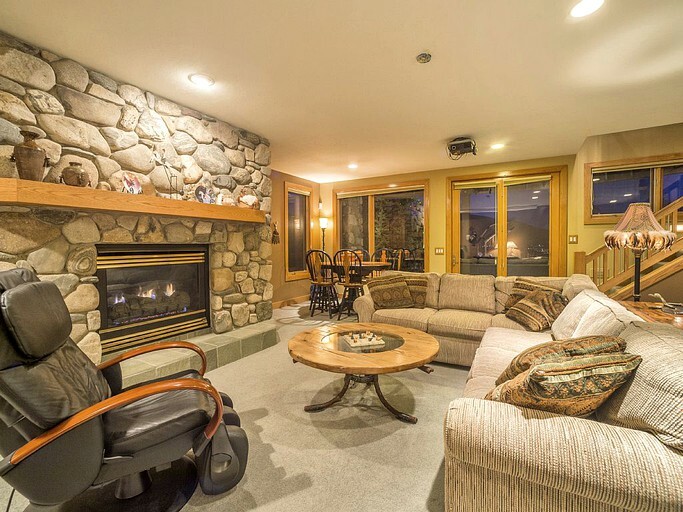 This one-of-a-kind property offers two, front-facing decks and one large rear deck furnished with outdoor dining and seating areas, which is a west-facing deck to take in the striking scenery. 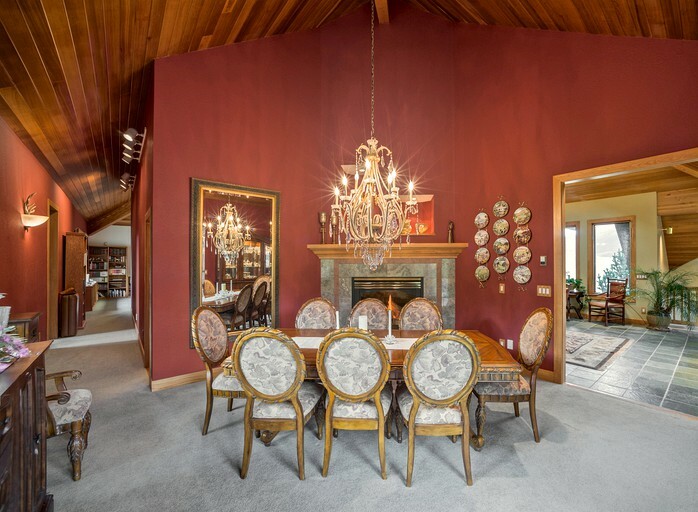 Located within the gates of a ranch, this secluded estate (8,000 sq. 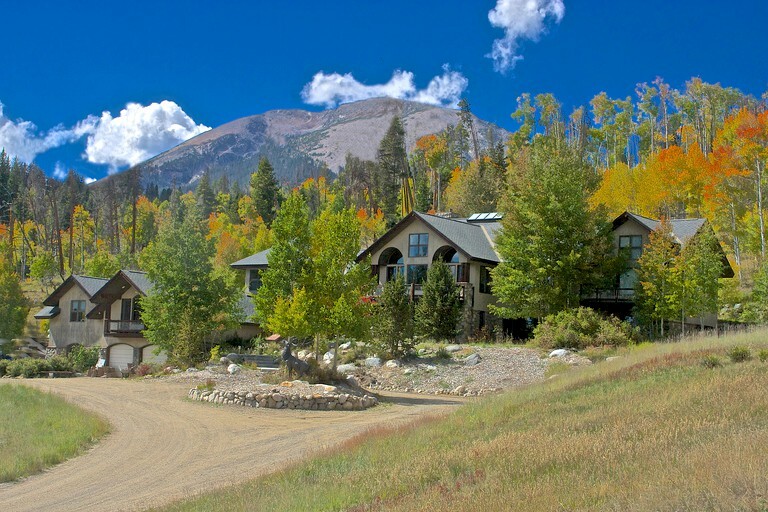 ft.) features a "one of a kind" setting—sitting on 40 acres of open meadow with a backdrop of aspen and pine forest. 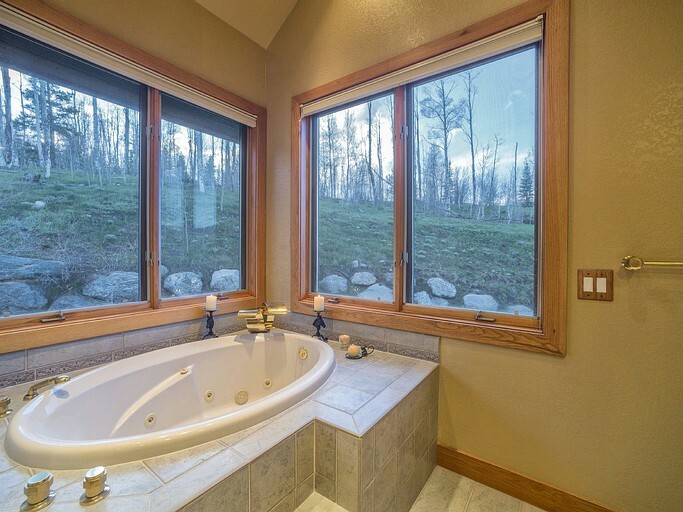 This amazing property is surrounded by wilderness and National forest and yet is just minutes from downtown Silverthorne, Dillon, I-70, and several ski areas. 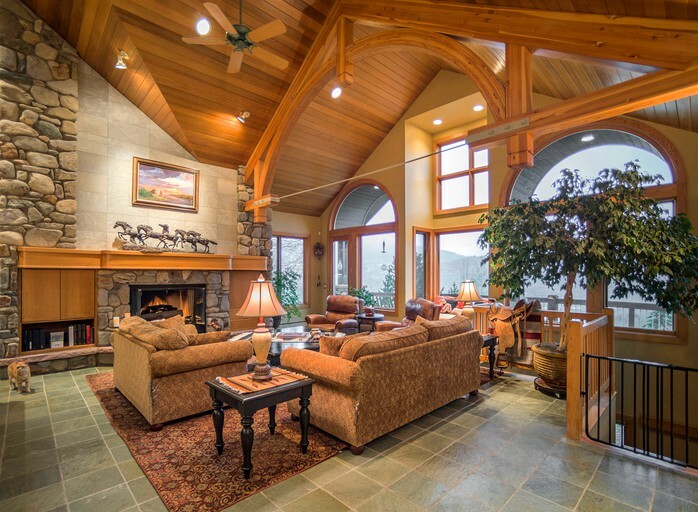 With rustic luxury style, log accents, soaring trusses, and views of the continental divide and Keystone Ski slopes, this home is the perfect blend of luxury in a unique ranch setting. Moose, fox, deer and herds of elk are known to roam the ranch, which operates as a functioning horse stable. Wildlife sightings are abundant. 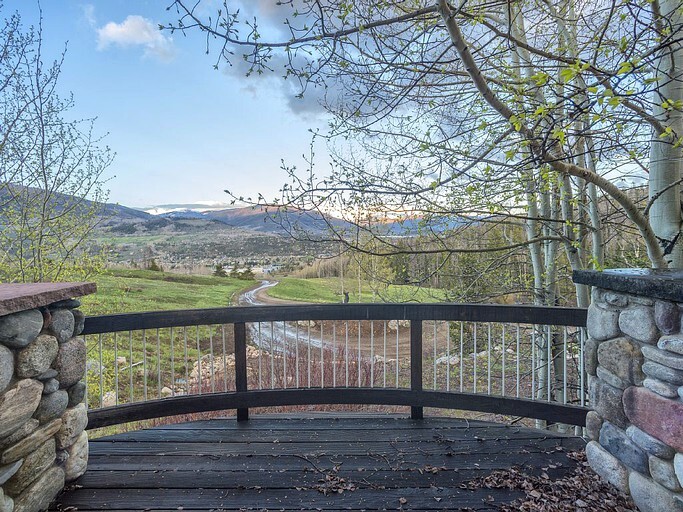 If guests are looking for a quiet and peaceful yet spectacular mountain location that is a five-minute drive from all of the amenities of the Dillon/Silverthorne area, this would be the spot. It can be reached in approximately one hour by car from the capital of Denver, where the nearest local airport is also situated. 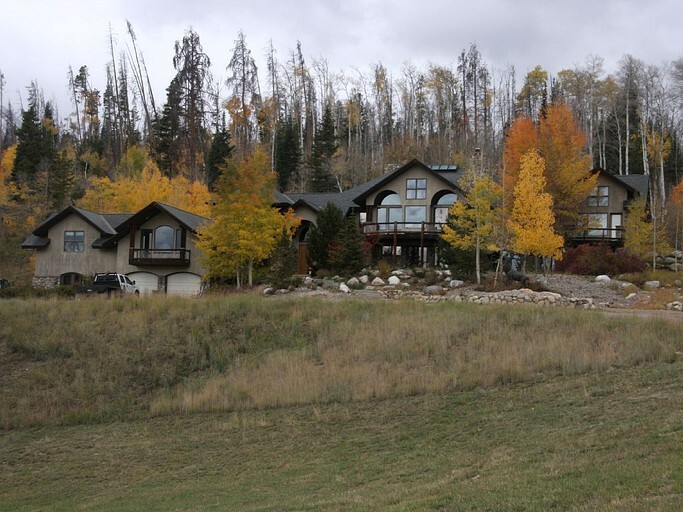 It is within close proximity to the popular ski resorts of Copper Mountain and Keystone Ski Area, which are just a 20-minute drive away. 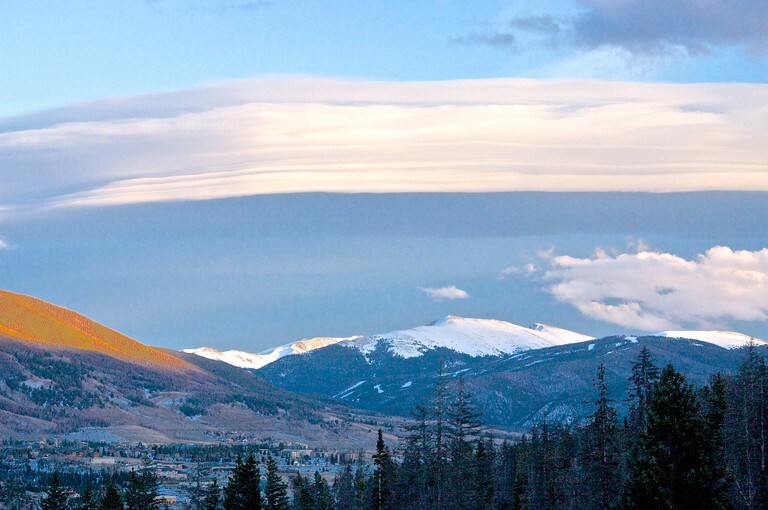 The Breckenridge and Arapahoe Basin ski areas are also accessible by car in approximately 30 minutes. 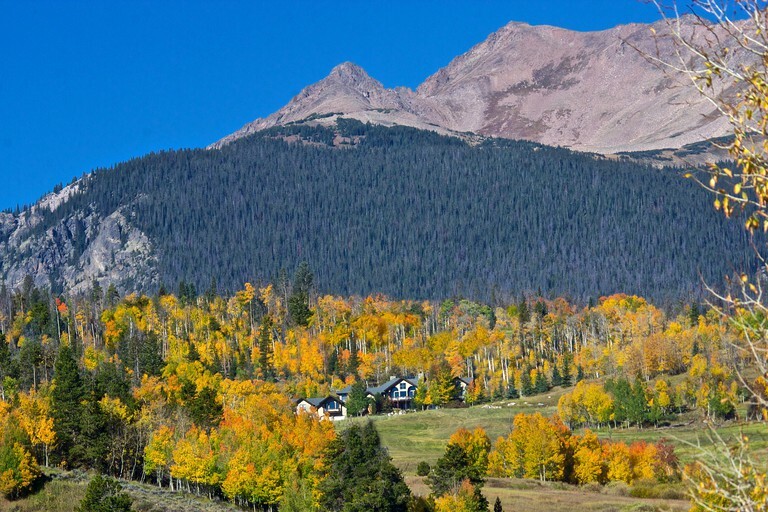 The Interstate I-70 and downtown Silverthorne are conveniently located just around the corner from the community. Additionally, guests will be right across the street from the Blue River and can reach the Dillon Marina and the Dillon Lake in just over 10 minutes by car, where they will also find numerous restaurants, shops, and local breweries. 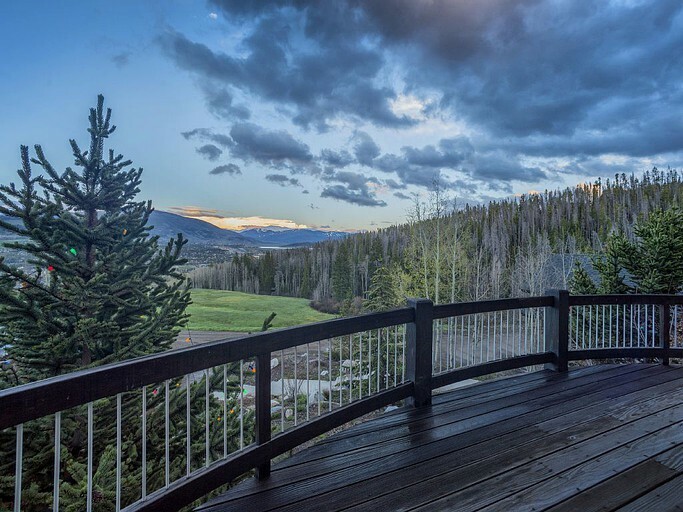 Conveniently positioned within close proximity to both stunning rural landscape and the local town center of Silverthorne, vacationers will find plenty to do in the local area, with outdoor activities abound. 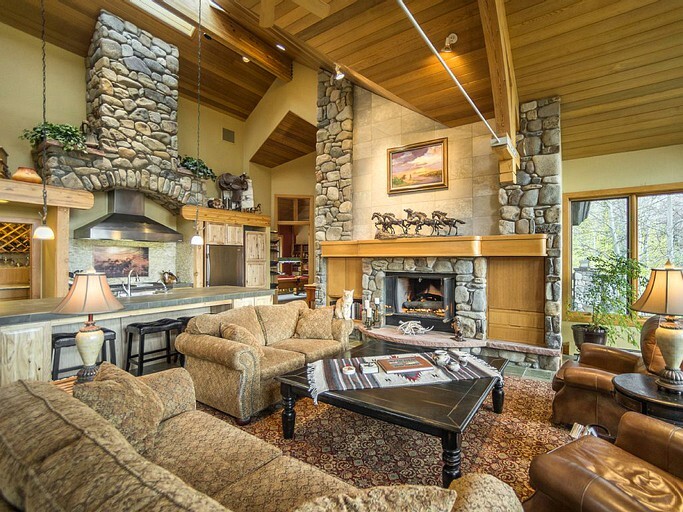 During the snowy seasons, this rental makes the ideal ski holiday getaway. 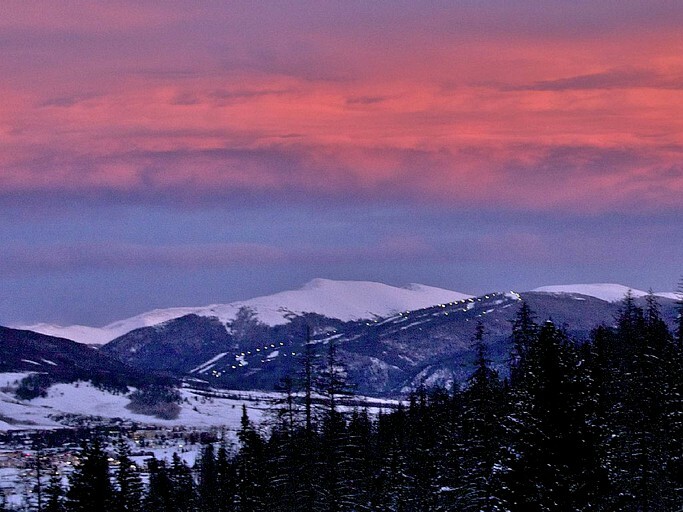 Guests can easily access the nearby ski resorts of Copper Mountain and the Keystone Ski Area, as well as Breckenridge and Arapahoe Basin within a 20- to 30-minute drive away. Other snow sports activities include; snow kiting, ice climbing, backcountry skiing, and snowmobile adventure tours. 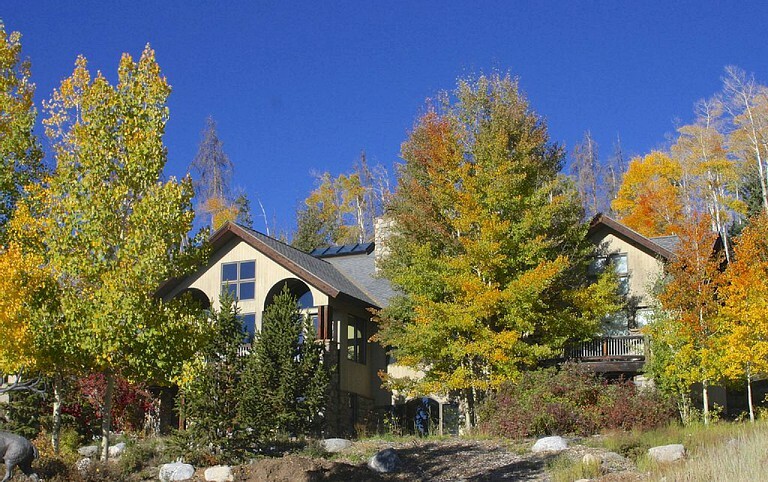 Within the close vicinity of the estate lies The Blue River for superb trout and fly-fishing. Just a 10-minute drive down the road brings guests to the Dillon Marina and Dillon Lake offering a sailing school and the option of renting a boat, a stand-up paddle board, or a kayak. For something a little more relaxing, visitors can go on a lovely sunset cruise, or explore the local breweries, restaurants, and shops, as well as the open-air farmers market. This vacation spot is perfect for the nature lover, with endless hiking and biking opportunities. In the neighboring town of Wildernest, more experienced hikers can access the Buffalo Mountain Trail with seven miles of breath-taking scenery and the chance of spotting the local wildlife. For a more accessible trail, the Lily Pad Lake and the Blue River Redpath offer a peaceful walk, bike ride, or cross-country ski route. One unique attraction that is worth a visit is the Silverthorne Ice Castles, which can be equally enjoyed during the day and night. For golf enthusiasts, The Raven at Three Peaks golf course is just a short three miles away. There is a minimum age limit for renters. 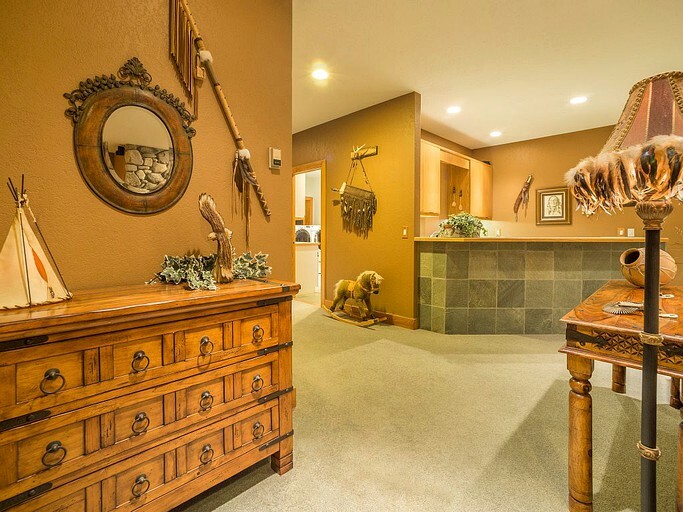 Children are welcome, and pets will be considered. 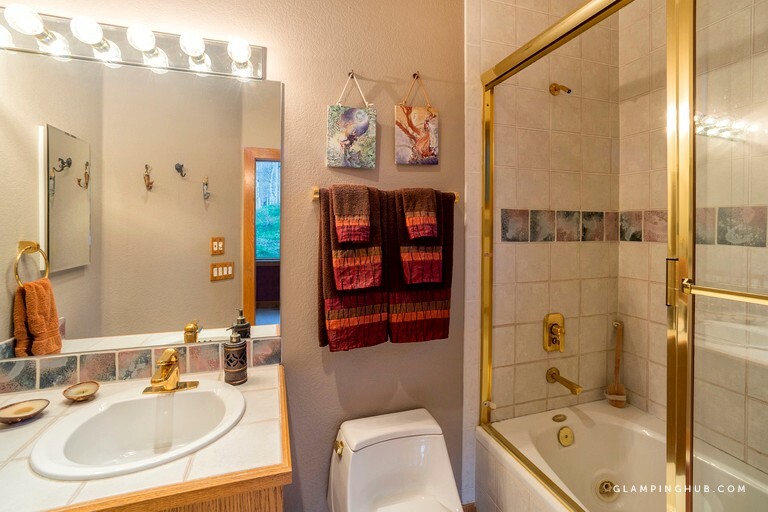 This is a non-smoking property and is accessible by wheelchair.